Today I want you to talk about a subject that might give rise to the same sense of dread as calculus. You will probably, like me, remember lessons back in school where your gaze wanders to the small glimpse of sky you can see through the grimy windows of your school. Indeed the subject today is punctuation. It took me many years and a course in creative writing to appreciate the importance of punctuation. I have grown to love the fact that it gives the reader a clear guideline not only to meaning but also to rhythm and intonation. Before diving into the subject of punctuation let me mention something about enjambment and end-stop lines in poetry. Enjambment is when the poet lets a sentence continue past a line break or a stanza into the next. Endstop is when every line break also ends a sentence (or at least a full part of a sentence). Punctuation can be used in combination with enjambment to tell where the original parts of the sentences exist. Just remember that poetry can never be like normal prose you break apart with line-breaks. To me punctuation adds a dimension to line-breaks and enjambment, making it clearer and can add a “backbeat” to the line-break rhythm. There are several good guides about punctuation, and besides I’m very far from an expert. Find a good source and use it and remember that some of the rules are quite ambiguous and you have to find your own style. Try to use different ways to end your sentences, using full stop (or period), question mark and exclamation mark. 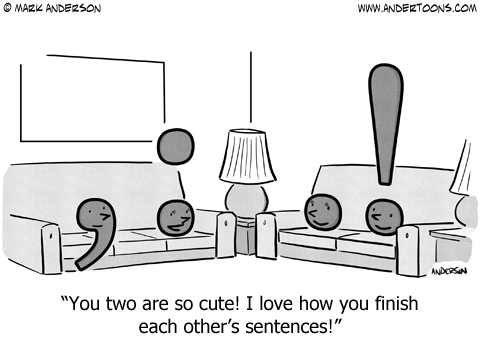 Try to separate the different parts of your sentences using comma, semicolon and colon. Hyphenate words to create enjambment within single words. Try to use apostrophes and quotation marks. Use parentheses to separate those parts that are less important. You do not have to use every single one of them, find your style and see how it changes the way the poem looks and how it may help a reader to get the meaning and the flow of your poem. Read it aloud for yourself and note how punctuation changes they you read it. But there are two punctuation marks that has a special place in my heart when it comes to poetry. The em-dash, which is twice as long as the normal dash/hyphen (—) which is very useful to give emphasis to a text or sometimes cut separate parts of a poem into pieces. Some haiku poets love to use instead of a cutting word. The second one is the ellipsis … which tells you that something has been omitted, which can be a great way for the reader to pour their thoughts into your poem. Ellipses is often used as a device in dialogues. In natural speech we often omit part of a sentence. In some cases ellipses and dashes can be interchanged. An ellipsis can of course also be used to allege or hint something that you cannot say in an action of self-censorship. Some of the more rare punctuation marks does not exist on the keyboard, but they can always be copied as a last resort. Personally I have done some changes to my settings so I get it automatically. For instance two consecutive dashes becomes an em-dash. To conclude this little feature I would like to talk about breaking the rules, and here comes the most important lesson. If you want to break a rule, you have to know the rule and have a clear intention. If you want to engage in rule breaking today, please include a note on the rules you are breaking. For this prompt you can either punctuate an existing poem or write something entirely new poem. When you are ready link up below, leave a comment and/or take part in the discussion below. Then visit and comment on other people’s poetry and focus on how punctuation works for you as a reader. Hello all.. I hope you enjoy this. I hope to see many innovative ways of using punctuation marks. Tonight I sit outside and wait for the house to cool off. Good evening everyone and thank you Bjorn for hosting. As an ex-teacher, I believe in learning how to use punctuation correctly and as a poet I believe in breaking the rules, so this is my kind of prompt! However, I’m on a bit of a low as it’s coming up to the anniversary of my dad’s death, which was four days before my birthday and always makes me sad, while at the same time I’m looking forward to seeing my daughter and grandson at the weekend. I’m excited to see what everyone does with this prompt. I loved the poem you wrote… what a great and subtle use of punctuation… of course I really challenged myself writing a prompt on punctuation with all these teachers and ex-teachers writing to the prompt. Yes, there’s quite a few of us and we (I)can be quite pedantic! I’m shaking in my boots now! Gosh, I’ll be re-reading and re-reading the information you’ve shared, Björn. So very helpful, particularly to a fledgling writer like me. I often feel I know what I’m doing with punctuation in verse but not in poetry. Can’t wait to jump in with an example soon! Very interesting prompt. I went in and re-worked a poem I wrote this morning, keeping in mind some of your teachings here. Thank you Bjorn. I welcome your feedback, so I can continue to learn as a poet. Thank you … it’s a lot of fun working with those little punctuation marks. I love the article, good advice. Unfortunately, I rarely capitalize but I do hope I can retain some of these suggestions/rules. I know it would give polish to my writing, just hard to break habit. Take a look at ee cummings, he still used punctuation such as dashes and parenthesizes in his poetry… you can use part of it or everything. That is what’s so great about poetry… the poetic license. Also haiku is often using some level of punctuation for the breaking word even if it’s most often written without capital letter…. Björn! An awesome prompt, sir! Hello, Versers! I’m sure you’ve missed me as I have missed you. Let the ellipses roll! OOPs, I did it again. I forgot to enter the month change. Please delete my first post. Sorry! I like this prompt. It really helps the flow to add some punctuation to the poem. I really found your post on Caesura, the pause in the poetic line. I have been using it ever since. Thanks for your good advice for those of us who need some help! welcome back… Mr Linky works as usual, you just have to accept the privacy conditions by clicking in the box. Thanks for an interesting post. I have been travelling for quite some months and no time for poetry. I am hoping to return to it soon. As you probably noticed I took some time off from writing and linking. Working my way back by slowly joining in again. Going to read now. A good lesson this time I use punctuation in my poetry now. I used to start each line with a capital letter and no punctuation until one day a poetess I liked asked me why I didn’t use it. I had no good answer and changed my ways then. She was right. I don’t use punctuation as much as I should but I think poetry is better with it. There are so many way to use the punctuation (or not)… parenthesizes and dashes are also included which I think ee cummings did a lot of..